Hello everyone ! I know its been a long time since I last posted over here. I am mostly on youtube or over on my facebook page if I am around at all. These days have been filled up with teaching my oldest daughter how to drive, helping with homework for my youngest, who happens to be in the 6th grade already! Where in the world does the time go I have no idea. However the time sure knows how to catch up with me if I am not careful. So its finally fall and finally cooler than it has been. I for one appreciate that fact. Whenever it starts to cool down I feel the need for cooking. Yes it is true I can enjoy a good pot of soup or stew even if its 100 degrees outside, thank the Heavens for air conditioning. However this recipe is a re vamped recipe of a soup I did years ago. 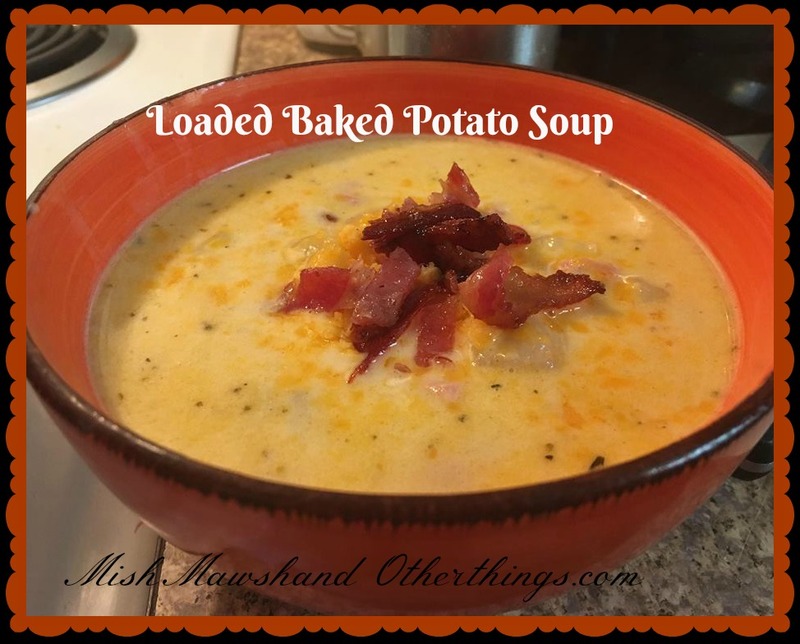 I thought I would share this recipe with you today because it was delicious and filling at the same time. In fact we still have left overs in the fridge from this, but dont worry it will not go to waste, as we are finishing it off as we go. I should mention that you can freeze this soup if you make a huge batch of it. Ok so lets get on with the recipe, shall we? 2 tablespoons of chicken base or 3 chicken bullion cubes your choice. In a large stock pot add 1 teaspoon of butter and the extra virgin olive oil. What the butter and olive oil will do is create a higher smoking point which basically means neither one will burn as quickly. Add in the chopped onion and ham. Cook the ham and onion together until the onion is just starting to brown and the ham or turkey which ever you use, has some color to it or cooked through. Next throw in the chicken base or bullion cubes with 6 cups of hot water. At this point you can add in your seasonings but save the salt and pepper for last. When the liquid comes to a boil add in the potatoes and simmer for about 20 minutes just until the flavors melt together. In a separate pan, add in your flour. Let that cook in a dry pan until it browns like a dark blonde color. Add the butter to the flour until the butter melts and forms little tiny balls. Slowly add in about 1 and 1/2 cups of the broth from the soup. Use half cup increments at at time, until smooth keep whisking it though. Now is not the time to walk away and do something else. Now when all the broth is used in the roux slowly add in about half of the cheese to the roux. When the cheese has melted into the roux, pour into the soup. Keep stirring the soup until its all incorporated. Turn the heat down to low and stir in the heavy cream and the rest of the cheese. Heat the soup through,stirring often. Chop your cooked bacon and set aside. When the soup is heated through, start serving into bowls and top with a few sprinkles of cheese and the chopped bacon. I know this recipe has a lot of steps but when you actually do it its no more than maybe 30 35 minutes from beginning to end. I hope you all get a chance to try this recipe and I hope you all enjoy it. As a side note you could add green onion to the top of this soup and a little sour cream as well. No one in my family likes those two things with this soup but I can see where someone may enjoy that. Hello all, yes I am here with a new recipe. Before I get into that though, let me just explain a few things. There have been many many changes going on in my life right now. One of those many changes is a new job. Aside from my kids this is where my focus has been lately. So you can expect me to be inconsistently consistent, when it comes to my recipes and videos. I will try to make sure there isnt a huge gap from one recipe to another but I cannot promise particular days because no day off is the same for me. So onto the recipe shall we. Fall is here and summer is gone and even though I could eat soups, stews and chowders all year round, I understand some cannot. Some people wait for the fall and winter months to hit. I know as strange as it may sound but shhh they do exist. This recipe is so easy to make and delicious. Its protein packed but rest assured if there is something in here you do not like, use something else. Want to keep it vegetarian ? Well you can do that too. Walk with me, talk with me and I will explain the ingredients and let you know what you can swap out to make it your own. and shhh my secret ingredient that gives it a little something something an 1/8 of a teaspoon of ground all spice. Once all veggies are peeled and diced, add your olive oil into a large pot with a heavy lid or a dutch oven. Add in all veggies and let them all simmer together. This is going to let all the flavors of the veggies marry up before you add in anything else. Also it will allow the potato to start thickening the juices from the veggies as well. From here add in the meat or meat substitute. Cook the meat right along with the veggies, the veggies are not fully cooked yet and once you eat this everything will be cooked and flavors will be popping. (FYI, if you use extra lean ground beef you can save yourself a step, you dont have to drain it because there is no fat to drain.) Now add in your beans and spices. Once you have all the spices stirred together with all the other ingredients, add in your beef broth or bullion and water. Simmer on medium heat for about an hour. When everything is thickened up and the veggies are fork tender, that just means you can shove a fork through them, the stew is done. Plate it up with some crackers or crusty bread and a salad and boom! Dinner is done! I hope you try this and love it like I did and a little tip there were no left overs. If you want left overs from this I suggest to double the recipe. Hi everyone! As some of you know I have adopted a healthier way of life. Sure its what I have to do to be successful however I knew before I had wls that I had to be all in or I just wasn't going to have the surgery at all. With that being said I still had cravings and I still get them. I hope this recipe will help those who may not have had wls but wants to still make healthier choices. Now I am not promising that this recipe is the paragon of good health but its an improvement on the classic chocolate cake. I will put alternatives you can use if chocolate is not your thing or if you are allergic down below this post. Pre heat your oven to 350 degrees. Spray non stick cooking spray in a cake pan or you can also use muffin tins for portion control. Next blend the beans and water in a blender or immersion blender. Now go ahead and open your cake mix and put it in a medium to large bowl. Add in the protein powder. Gradually add in the bean and water mixture. What I did is just make sure the liquid was incorporated into the batter before adding more. The bean and water mixture looks like it will be too much but I promise you its just enough. After everything is incorporated, add the batter into the cake pan and bake for about 45 minutes. Dont bother using the toothpick method to check for doneness because of the beans its never going to look done. So if you notice the top of the cake springing back with you lightly tap it with your hand, then its done. You do not have to wait for the cake to cool to frost it, in fact its important to frost it while its still hot. Because we are not using a traditional frosting just preserves the heat from the cake will make the preserves spread better. So cover the cake with the raspberry preserves and you can serve immediately. 1 scoop of vanilla cream protein powder, look for whey isolate because its not from concentrate and has a lot of protein. Now just follow the above instructions! I hope you all enjoy this as much as we all do. Now I can have my cake and eat it too! So I hope you all enjoy this as we all enjoyed this in my house. Pre heat your oven to 375 degrees, we are going to bake the chicken instead of frying it. Grab two bowls, I find mixing bowls work well for this. Add your beaten egg to one and then add your seasonings, breadcrumbs and Parmesan cheese to the other one. Now that you have your station set up, go ahead and grab your chicken breasts. They should already be cut length wise. Now dredge your chicken in the egg and then the breadcrumb mixture. Place the chicken on a cookie sheet that has been sprayed with non stick cooking spray. Once the chicken is all breaded, place it on the oven for about 20 minutes. Now while the chicken is cooking, grab your sauce and warm it up on the stove, and start making your pasta. Just follow package directions. If you are using fresh pasta wait until everything is almost done and cook it for a few minutes in boiling water. Now once the chicken is done grab a casserole dish and coat the bottom of it with the sauce you just warmed up. Add the chicken, then top it with most of the sauce. Leave about half for the pasta. Top the chicken and sauce with the cheese and put back into the oven until the cheese melts and the chicken absorbs the sauce. (about 15-20 minutes depending on your oven.) Once the pasta is done, drain it and add the sauce to it. Now take your chicken out of the oven and plate it up. Serve a side salad and you have a delicious meal. From start to finish this took me about an hour to prepare and serve. You can let the sauce stew longer to concentrate the flavors if you wish. Hi everyone, the recipe we will be making today is very time consuming. Its the longest recipe I make, however your patience is key. Everyone thinks fried chicken is a very simple when you know how to do it. It is very simple however the key to making fried chicken that stands above all others including some fast food restaurants that shall remain nameless, this is where your patience will pay off. This fried chicken has so much flavor and crisp, you will be slapping your own self away from the table to get a piece of it. Yes it's a labor of love and your hard work will pay off. So follow me as I take you through day by day for my 3 day fried chicken! Day 1: Grab a large bowl with a lid and add the 3 tablespoons of salt and cold water, stir and allow the salt to dissolve some and add your chicken. You will want the water to cover the chicken but don't over flow or you wont be able to close the lid to the bowl. Now let the chicken sit for 24 hours in your fridge. Day 2: Once 24 hours is up drain all the water and rinse the chicken. Now add in the buttermilk leave about 2 inches from the top empty because the weight of the chicken will make the buttermilk rise. Now add in the chicken. Put the lid back on and let sit for another 24 hours exactly. Day 3: Now its time to fry your chicken, first you need to drain off the buttermilk but DO NOT RINSE. Pat the chicken dry with paper towels. While the chicken is drying add about 2-3 cups of vegetable oil to a cast iron frying pan or just use what you have for a frying pan but cast iron works the best, turn your burner to medium heat to let the oil come to cooking temperature. To tell if the oil is ready sprinkle a tiny bit of flour in the oil if it starts to bubble up really nice then you know the oil is ready. Now grab two bowls large enough for your chicken. In one bowl add your beaten eggs and hot sauce. In the second bowl add flour, corn starch and seasonings to. Mix them up with a fork. Now once your chicken is dry add the chicken to the flour and seasonings, then the egg and back to the flour. This will make a good coating for frying. Once all your chicken is coated, slowly and gently add the chicken to the oil and cook for 15 minutes on each side. Because my chicken was so large I had to pre heat my oven to 350 and let the chicken fully cook for another 20 minutes. However smaller pieces of chicken like chicken legs can be fully cooked right in the oil. Once the chicken is in the oil though DO NOT MESS WITH IT! Leave it alone for 15 minutes or until you see parts of the underside of the chicken that are golden brown. If you move the chicken around you will lose all that coating and all those 3 days will be all for not. Once all the chicken is cooked grab a lint free tea towel and a large bowl to put your chicken in and serve it up. As always any and all sides go well with fried chicken. Down below is a video where you can see step by step what I did. I hope your family enjoys this recipe as much as my family does. Live , laugh and love. Hi everyone! Today I have a recipe for you that you can throw together with left over ham from Easter, if you are like me and freeze the left overs. I made some toast points, cut up some carrots, celery, bell peppers and called it lunch. The kids loved it and even better than that, there were no left overs. Preheat your oven to 350, next grab a medium mixing bowl and cream together the cream cheese, mustard, mayo and sour cream. Blend them together until you have a rich creamy texture. Now add in the ham, green onions and shredded cheese. Mix until all ingredients are incorporated. In a small casserole dish or whatever baking dish you have on hand, spoon in the ham and cheese mixture and spread evenly into your baking dish. Sprinkle the top with a little more shredded cheese and bake uncovered for about 30-45 minutes, or until hot, bubbly and golden brown on top. When the dip comes out of the oven, sprinkle the top with Cayenne pepper (optional). I cut up some toast points, and veggies and the kids had this for lunch. They loved it and I loved the fact that there were no left overs. Have you ever had a craving for one thing and by the time you made what you were craving, it turned into something completely different? Let me explain, a few days ago I was craving french fries. Yes even after gastric bypass you still get hungry, you still get cravings. It happens a lot more than what people admit to also. Well obviously I didn't have french fries but I have been finding since I made these little gems, I crave these instead. Its a good thing too because they are very good for you. I will give you the recipe to both the dip and the apple fries because even though they are great on their own, when they are together, Oh my goodness gracious! They are something to be had. Preheat your oven to 375 degrees and spray a cookie sheet with non stick cooking spray. You will want to slice up your apples like fries, all I did was slice off pieces of the apple around the core. Then I sliced those chunks thin to make skinny half moon shapes. After my apples were sliced, I mixed the sugar and cinnamon together on a large plate, and threw my apple slices in the cinnamon mixture. Make sure to coat all sides of the apples. Now just arrange them on your cookie sheet so they are not touching one another. Bake for about 20-30 minutes and flip them once half way through the cooking time. While those are cooking, its time to whip up the dip. Grab your yogurt and add in your cinnamon sugar mixture about a tablespoon. Mix it all up and store it in your fridge until your apple fries are out of the oven. Once the apples are finished cooking, start taking the apples off the cookie sheet. DO NOT LET THEM COOL ON THE COOKIE SHEET! They will stick like cement. Serve them on a plate with some of the dip and boom you are in snack Heaven, and you didn't have to break your diet to do so. Its a win win situation. I hope you all enjoy your apple fries and whether or not you make the dip with them is totally up to you but for me you cannot have one without the other. Live ,laugh and love everyone.